So we all remember what my living room looked like two days after moving in? See above. Ehh.. it's good. Not great. My original goal was to do a neutral space. Mission accomplished, I'd say. But it ended up a bit drab. I wanted more drama. And surprisingly, I wanted more color. But what color, I did not know. So I sat on it. Or in it, I should say. And nearly two months have passed. One thing - non-color related - became clear very quickly. We needed more seating. A couch and a chair was good for seating three comfortably. 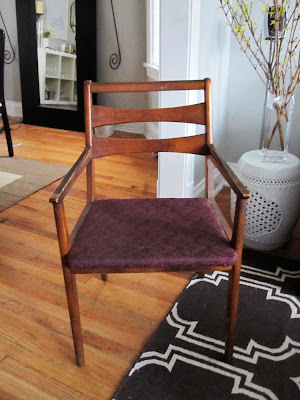 But Nate and I constantly found ourselves grabbing a chair from the dining room to accommodate our visitors. Enter my favorite Chicago thrift store. I found this beauty for $28. It's a sturdy piece, and the lines reminded me of pricey, designer Danish pieces. Yes? No? Doesn't matter. The upholstery was less than ideal, and there was zero padding to cushion keisters. Enter a trip to JoAnn Fabrics. I've recovered chairs before, but never added new cushion. 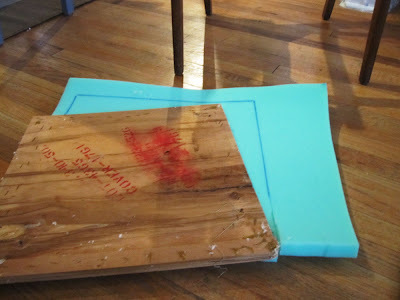 This process was all a guessing game, but I figured I'd document the project in case I messed up (and in which case I'd ask all of you for help!) Anywho, I bought a piece of one-inch foam for $5, traced the seat, and cut. Simple enough. Then I grabbed my uncle's trusty electric staple gun (that I've had on loan since December - thanks, Uncle Greg!) and went to town on the batting. My thought was that this would secure the foam in place. So far so good. I bought a yard of two different fabrics, both on on sale, both of which I loved. Nate cringed when he saw the zebra (said it looked like a dead animal). I liked it and it went with our neutral room, but I tried the second fabric. It was a funky geometric pattern and it was PINK! I have nothing pink in my house. NOTHING. And for some reason I was drawn to this. Nate's response? "These are our options?" I laughed. This is how helpful he is. And for one reason or another, I decided on the pink. Of course that meant I had to change out the pillows for some lighter colored ones. Add in a few fresh flowers, wave of my wand, and Bippity. Boppity. Boo! It's SPRING in our living room! Magic! Isn't it pretty?!? So, what's you do this weekend? I love the chair! I just made one myself, also with a new foam cushion from Joanns. Your living room looks great, and ready for spring. I went venturing to Walmart and Home Goods. At Walmart I bought a new comforter set that has greens and browns. What a difference it made to my room. I'm thinking of repainting my bedroom a cream color as my bathroom is already the celery color and has a matching shower curtain with the colors from my bedspread. I don't want to over do it with the green. Then I went to Home Goods -- my first time. My mission was to find a nightstand with a shelving area and two drawers that could be tucked away in the corner and have a small light fixture on it. My mission was accomplished and I found one that is a cream color with an aged look. Then I moved onto chairs. Since my daughters busted the chair in my room I had to find another. Mission accomplished I found a brown leather chair with a high back and had bronze nail tacking on the edges of the frame and a very comfortable seat. My second chair is for my daughters room. I found a beautiful cream colored swivel chair. Alaina -- I was the one that wrote you about no more pink room and you were helping with me look for loft bedding. We are still looking and I believe we have come to a solution in a college dorm frame where one bed is up high and the other is low to the ground and tucked under the other bed -- like an L shape. I'm ready to order it. We repainted the room your favorite Teal color, replaced blinds with white faux wood, re-did their closet with custom made shelving and drawers, took down the closet doors and put a brushed silver curtani rode with clear glass knobs on the ends of the rode with a teal sheer curtain. It looks really cool when the curtains are closed and makes it easier for them to go in and out of their closet. Their bedding has teal and purple and can be reversible to their suiting. They also have a wall mounted TV which was their Xmas gift. They don't like where it was placed, but it was the only wall suitable for everyone to see it. Hopefully by the end of the month we can order the bed and they can friends over and enjoy conversation, play their I-pods and/or a movie. I'll have to send a picture when we get done. I think the pink is lots of fun! Boys just don't understand :) Sometimes it's the small things that make you feel better; I've been doing a bit of furniture re-arranging myself this weekend and it just makes me giddy! 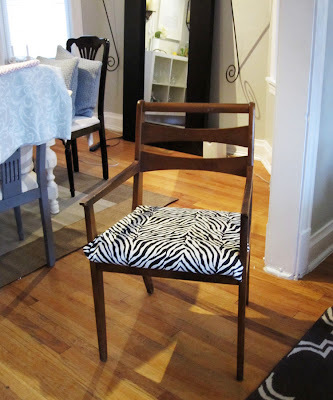 Gorgeous and what a great DIY project! love it! 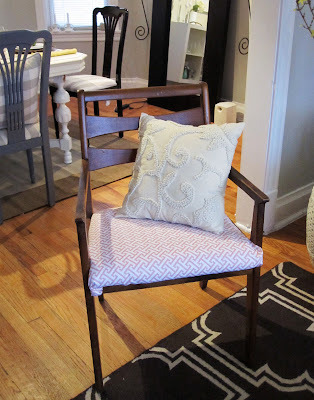 reupholstering the chairs in my dining room made a huge difference too - it's my favorite way to get a little oomph in a room on the cheap. where is the joann's fabric you went to? the fabric stores in the burbs are seriously lacking these days and i need to find something fun to make a cushion for a piece i have in front of my bed! Well we already know from your header how well pink and gray go together, so it was only a matter of time, really. Looks so fresh! Love your living room and the fresh new changes. Your new chair is too cute and I like the fabric you chose. Just found your blog, off to read more. I love the presentation on your blog. Takes me on a real journey. Kudos! Love the pink! I think your living room looks awesome! Can't wait to really decorate my own apartment! Great job and great man to be open to a pink chair in the living room! what are your thoughts on helping family when the time comes for much needed home renovations?!?! Love your blog! 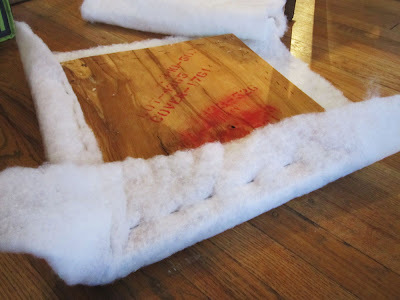 So fun to find other design blogs based out of Chicago. And, I love love Brown Elephant! Your living room looks fantastic. oooh you did a great job on that chair! 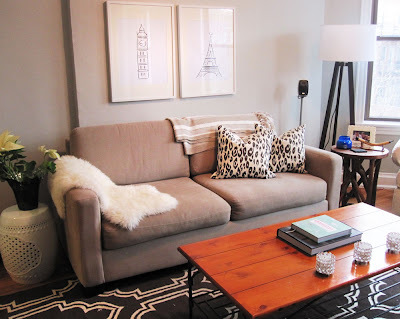 And I really love the rug ~ West Elm? 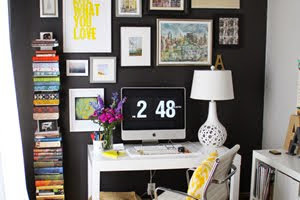 love the room, the chair and your blog! i've been looking for a local (chicago) design blogger and found yours today through MadebyGril! so glad i did! A touch of Pink Makes Everything fun! Looks Awesome!! anyways, i just wanted to drop by and let you kow how wonderful i think you are! Just stunning and really inspiring..!! Very nice! I really like the whole room. So cute! I love the prints on your wall above the couch, they're precious. Alaina - your home is beautiful! I can't wait for my invite!! It certain shows your "spirit" and style. I'm so proud of you. What is that gray paint color in your office? I LOVE it. I am totally inspiring my office around yours. I have been leaning in the direction, I already painted my desk white, and wanted to do one black wall. Then tonight I found your blog and thought "THATS IT!!!" You put it together wonderfuly!!!!!!!!!! Love your home! Where can I get those great pictures/paintings of all the different buildings from around the world? Where can I purchase the art above your living room sofa? I fell in love at first site? 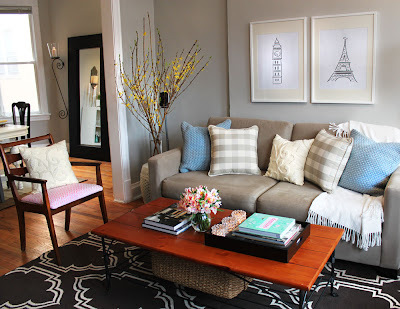 Wow, it looks stunning, love the rug and the way you've put everything together, casual chic- I like it! Clever, clever girl! It looks fantastic! So pretty! 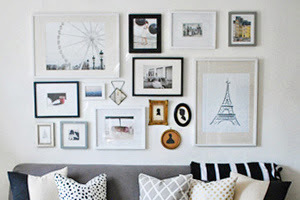 I have a hard time "finishing" a room so this is great inspiration on those little changes that make a huge difference!